It’s Father’s Day in Australia the first Sunday of every September. I spent the day madly shopping for presents. (I have a terrible habit of leaving everything till the last minute). I couldn’t imagine going home and cooking. I honestly gave up any hope of completing this week’s French Fridays with Dorie recipe. I was tired and truth be told… it wasn’t a recipe that appealed to me in any way! Raw zucchini? Umm… no thanks. If I saw this on dish on a menu, I would skim right over it! I decided I would stop by the Foodhall at David Jones (it’s pretty fancy in there) and splurge on dinner. 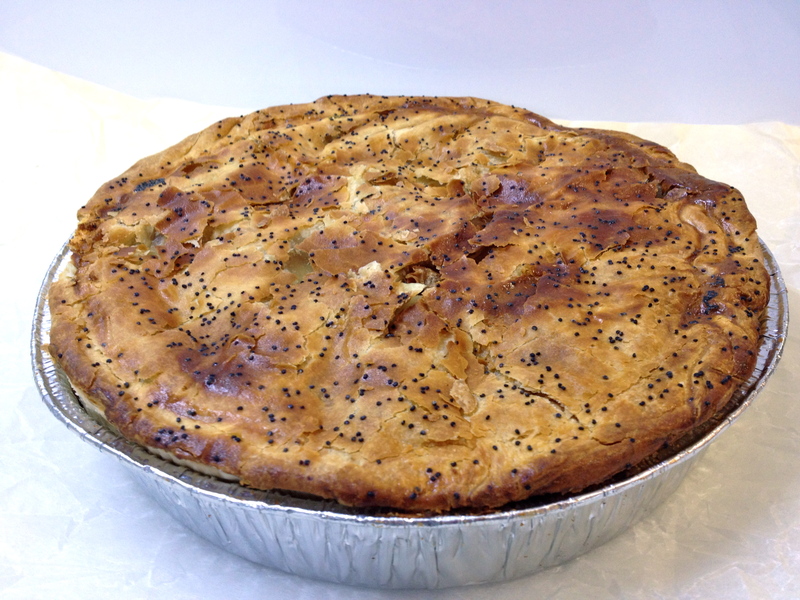 I couldn’t go past the Chunky Beef Pie by Simmone Logue Fine Food Company. Pies are about as Aussie as you can get. I felt I needed to serve it with a salad, I don’t know why, maybe it’s a mum thing? But a salad doesn’t really go with a meat pie. I started to toy with the idea of serving it alongside the pie. Imagine finding a salad that would go with a meat pie! The zucchini was meant to be cut into long thin strips that resemble tagliatelle. 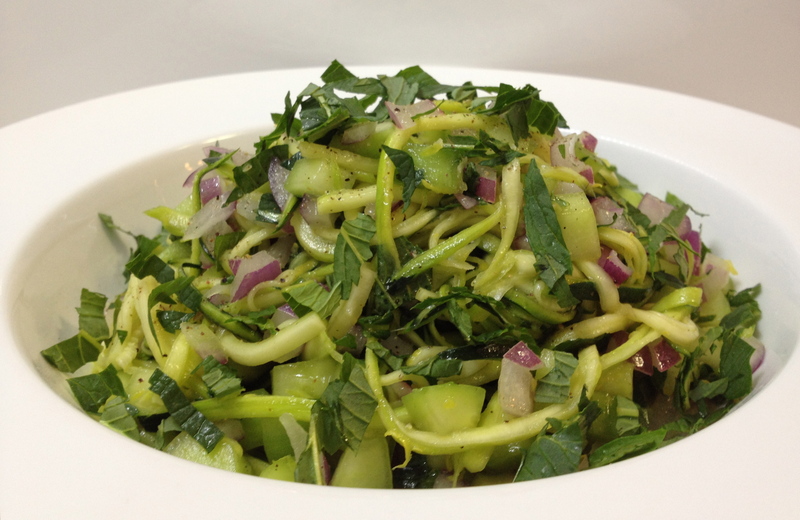 I just couldn’t imagine eating wide strips of raw zucchini! So I used my magic slicing machine (that’s what I call this contraption cos I don’t know it’s real name! Sorry!) to cut my zucchini into thin spaghetti shaped strips. This salad tasted great on it’s own and went surprisingly well with the pie. The acidity from the lemon complimented the chunky beef filling in an oddly similar way to our traditional side of tomato sauce! And very, very pleased with myself! The salad also tasted good on it’s own, I’d make it again, probably with grilled chicken next time! The recipe has been published on Bon Appetit if you’d like to see it for yourself! And to see more reviews and thoughts on this dish, head over to French Fridays with Dorie. Tags: cooking, food, french fridays with dorie, recipes, salads, zucchini | Permalink. Very nice! 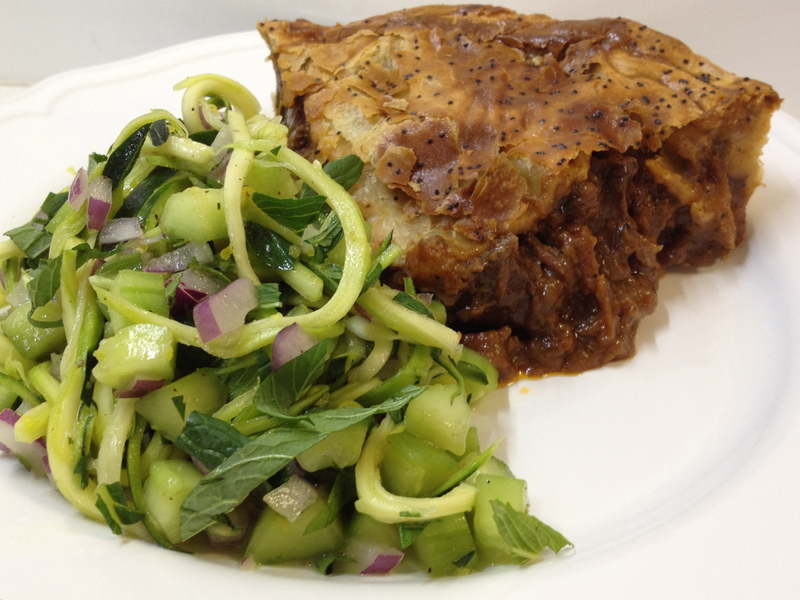 The zucchini is hearty enough to stand up to the meat pie (which looks delicious). Sanya, I think you made a good choice when you turned the zucchini into vermicelli instead of tagliatelle. The wide planks (mine didn’t turn to ribbons) of zucchini didn’t make for the most salady salad. I like the look of yours much better. Your salad looks wonderful. A great idea serving it with the meat pie which also looks delicious:) You prepare a wonderful dinner. Oh, that is one beautiful take on this salad and I bet it was excellent with your pie! I love how you did the zucchini ribbons, while I enjoyed my version very much, I think that next time I will slice my zucchini the way you did yours…thanks! Love how you cut the zucchini – your salad looks beautiful and it’s a good shape to stand up to the heartiness of the pie. I too think it is the little details that make the difference, not only in food… Lovely salad and I like the idea of a meat pie alongside it. Have a great weekend! enjoyed it more. I love pie, savory or sweet, especially the crust. Have a great weekend. Oh yum! A meat pie!!! Brings back memories. I think you made the right choice on prepping your zucchini – the “slabs” weren’t very appealing. I can imagine this salad being better with the rich flavors of the pie. Great job!! And happy Father’s Day. The salad and the pie both look delicious! If I had had your meat pie, Sanya, I would have loved the salad. As it was, I didn’t and I didn’t. This is the first recipe since I joined FFWD in May/2011, that didn’t work for me. I have to admit, however, that the salad does seem perfect with your Aussie pie. Happy Father’s Day, late. I wasn’t too wild about the salad, but that meat pie is another story all together…it looks amazing! Glad you enjoyed the salad – I’m having trouble getting excited about this week’s recipe so make take the opportunity to catch up on a missed recipe. great idea!!! I’m not a raw zucchini fan either. This week’s French Friday recipe was a good way to start back into things: an easy cold salad where I get to use an obscure piece of kitchen equipment and try to track down an exotic ingredient. Tasty Mayhem heaven. I had a moment of concern seeing the word “tagliatelle” in the title since I’m not eating pasta; no worries, these “noodles” are strips of zucchini which are mixed with chunks of cucumber and dressed lightly with lemon, mint and pistachio oil.